The Pilates reformer is a traditional piece of Pilates equipment which looks like a bed with springs, a sliding carriage, ropes and pulleys. 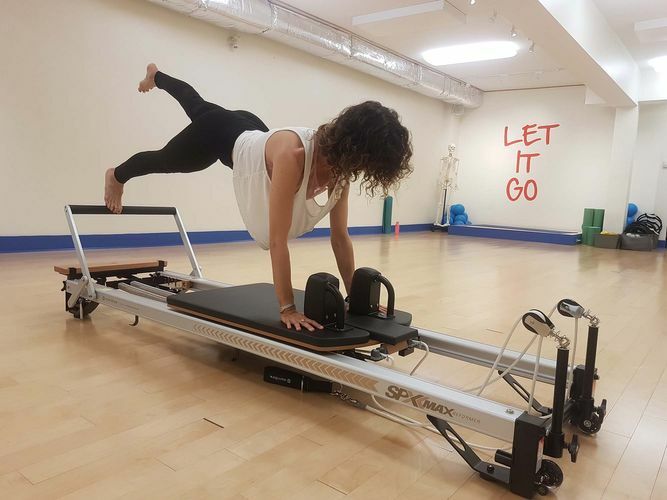 Reformer Pilates is similar yet very different to mat based Pilates. 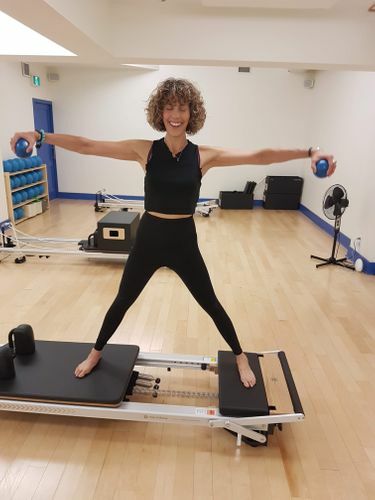 Reformer Pilates is done using the Pilates reformer machine and is generally more intense and more dynamic than mat based Pilates as it adds resistance to the Pilates exercises via the use of the springs which form part of the machine. We have eight reformer classes on our schedule, and by Thanksgiving 2018 we will have an additional four classes, bringing our weekly total to 12! We have also added three reformer teachers to our roster. To create cohesion in our classes and to assist students in forming an understanding of what they can expect from each class we have crafted four class descriptions. The list of classes starts with the most beginner friendly option. Meet the Machine: Get set up on the machine. Learn what your machine settings are and how to set yourself up for a class. Meet the instructor & tell her about you and your fitness goals. Dynamic: An energetic and demanding class designed to work the entire body. Creative and playful sequencing will also challenge your coordination. Expect many progressions as the class explores many different movements. Suitable for all levels. Balance: An energetic and playful class with a focus on exploring the connection between core and balance poses. Expect to be standing on the reformer for at least one sequence in this class. Suitable for all levels. Cardio-Tramp: A playful and intense workout with a focus on incorporating cardiovascular fitness into a reformer class by using the Cardio-Tramp Rebounder! Expect to work both on and off the machine in this class. Provides a low impact cardio challenge and a high calorie burn. If you have never been on a reformer before we strongly recommend that you take an Intro Reformer: Meet the Machine Class. 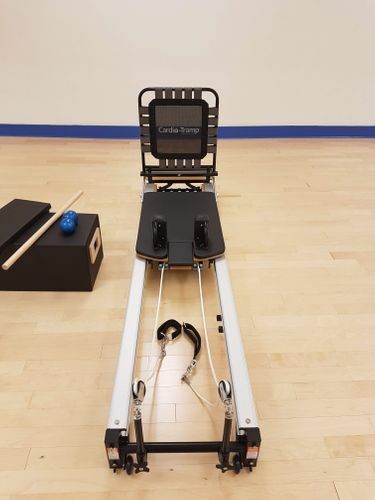 This is a private or semi private class that we will schedule with an instructor to introduce you to the machine, how to set up the reformer before class, and some of the movements you may expect to see in a group class. $45+hst. Please email: jessica@studioblue.co and we will find a time that works for you. Cancellation Policy: Early cancel within 6 hours free of charge. If you have to cancel less than six hours before a booked class, your class package will be deducted a class or if you are a month member your credit card will be charged for the missed class. We only have five machines – please register for class so that you can save your spot on one of our four machines. $90+hst. These 4 classes are to be used within 30 days. That is only $22.50 per class, which is 25% OFF a drop-in class.